For the Umayyad Mosque of Aleppo, see Great Mosque of Aleppo. After the Muslim conquest of Damascus in 634, the mosque was built on the site of a Christian basilica dedicated to John the Baptist (Yahya), honored as a prophet by Christians and Muslims. A legend dating to the 6th century holds that the building contains the head of John the Baptist. The mosque is also believed by Muslims to be the place where Jesus (Isa) will return at the End of Days. The mausoleum containing the tomb of Saladin stands in a small garden adjoining the north wall of the mosque. The site is attested for as a place of worship since the Iron Age. Damascus was the capital of the Aramaean state Aram-Damascus and a large temple dedicated to the cult of Hadad-Ramman, the god of thunderstorms and rain, was erected at the site of the present-day Umayyad Mosque. One stone remains from the Aramaean temple, dated to the rule of King Hazael, and is currently on display in the National Museum of Damascus. The Temple of Hadad-Ramman continued to serve a central role in the city, and when the Romans conquered Damascus in 64 BCE they assimilated Hadad with their own god of thunder, Jupiter. Thus, they engaged in a project to reconfigure and expand the temple under the direction of Damascus-born architect Apollodorus, who created and executed the new design. The Roman temple, which later became the center of the Imperial cult of Jupiter, was intended to serve as a response to the Jewish temple in Jerusalem. The Temple of Jupiter would attain further additions during the early period of Roman rule of the city, mostly initiated by high priests who collected contributions from the wealthy citizens of Damascus. The eastern gateway of the courtyard was expanded during the reign of Septimius Severus (r. 193–211 CE). By the 4th century CE, the temple was especially renowned for its size and beauty. It was separated from the city by two sets of walls. The first, wider wall spanned a wide area that included a market, and the second wall surrounded the actual sanctuary of Jupiter. It was the largest temple in Roman Syria. Towards the end of the 4th century, in 391, the Temple of Jupiter was converted into a cathedral by the Christian emperor Theodosius I (r. 379–395). During its transformation into a Christian cathedral it was not immediately dedicated to John the Baptist; this was a later association, which came about in the 6th century. Legend had it that Saint John's head was buried there. It served as the seat of the Bishop of Damascus, who ranked second within the Patriarchate of Antioch after the patriarch himself. Damascus was captured by Muslim Arab forces led by Khalid ibn al-Walid in 634. In 661, the Islamic Caliphate came under the rule of the Umayyad dynasty, which chose Damascus to be the administrative capital of the Muslim world. The sixth Umayyad caliph, al-Walid I (r. 705–715), commissioned the construction of a mosque on the site of the Byzantine cathedral in 706. Prior to this, the cathedral was still in use by the local Christians, but a prayer room (musalla) for Muslims had been constructed on the southeastern part of the building. Al-Walid, who personally supervised the project, had most of the cathedral, including the musalla, demolished. The construction of the mosque completely altered the layout of the building. While the church (and the temples before it) had the main building located at the centre of the rectangular enclosure, the mosque's prayer hall is placed against its south wall. The architect recycled the columns and arcades of the church, dismantling and repositioning them in the new structure. The new house of worship was meant to serve as a large congregational mosque for the citizens of Damascus and as a tribute to the city. In response to Christian protest at the move, al-Walid ordered all the other confiscated churches in the city to be returned to the Christians as compensation. The mosque was completed in 715, shortly after al-Walid's death, by his successor, Sulayman ibn Abd al-Malik (r. 715–717). According to 10th-century Persian historian Ibn al-Faqih, somewhere between 600,000 and 1,000,000 dinars were spent on the project. 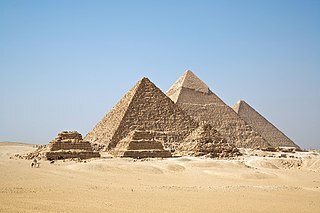 Coptic craftsmen as well as Persian, Indian, Greek and Moroccan laborers provided the bulk of the labor force which consisted of 12,000 people. Byzantine artisans were employed to create the mosaics, still visible, which depict landscapes and buildings in a characteristic late Roman style. Ibn al-Faqih relays the story that during the construction of the mosque, workers found a cave-chapel which had a box containing the head of St. John the Baptist, or Yaḥyā ibn Zakarīyā in Islam. Upon learning of that and examining it, al-Walid I ordered the head buried under a specific pillar in the mosque that was later inlaid with marble. Following the uprising that ended Umayyad rule in 750, the Abbasid dynasty came to power and moved the capital of the Caliphate to Baghdad. Apart from the attention given for strategic and commercial purposes, the Abbasids had no interest in Damascus. Thus, the Umayyad Mosque reportedly suffered under their rule, with little recorded building activity between the 8th and 10th centuries. However, the Abbasids did consider the mosque to be a major symbol of Islam's triumph, and thus it was spared the systematic eradication of the Umayyad legacy in the city. The Abbasid governor of Damascus, al-Fadl ibn Salih ibn Ali, built the so-called Dome of the Clock[dubious – discuss] in the eastern section of the mosque in 780. Nine years later, he initiated the construction of the Dome of the Treasury with the purpose of housing the mosque's funds. The 9th-century Arab geographer, al-Muqaddasi, credited the Abbasids for building the northern minaret (Madhanat al-'Arous; "Minaret of the Bride") of the mosque in 831 during the reign of the caliph al-Ma'mun (r. 813–833). This was accompanied by al-Ma'mun's removal and replacement of Umayyad inscriptions in the mosque. By the early 10th century, a monumental clock[dubious – discuss] had been installed by the entrance in the western part of the southern wall of the mosque (Bāb al-Ziyāda.) This clock seems to have stopped functioning by the middle of the 12th century. Abbasid rule over Syria began crumbling during the early 10th century, and in the decades that followed, it came under the control of autonomous realms who were only nominally under Abbasid authority. The Fatimids of Egypt, who adhered to Shia Islam, conquered Damascus in 970, but few recorded improvements of the mosque were undertaken by the new rulers. 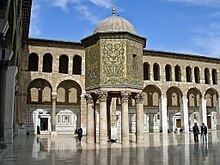 The Umayyad Mosque's prestige allowed the residents of Damascus to establish the city as a center for Sunni intellectualism, enabling them to maintain relative independence from Fatimid religious authority. In 1069, large sections of the mosque, particularly the northern wall, were destroyed in a fire as a result of an uprising by the city's residents against the Fatimid's Berber army who were garrisoned there. The Sunni Muslim Seljuk Turks gained control of the city in 1078 and restored the nominal rule of the Abbasid Caliphate. The Seljuk king Tutush (r. 1079–1095) initiated the repair of damage caused by the 1069 fire. In 1082, his vizier, Abu Nasr Ahmad ibn Fadl, had the central dome restored in a more spectacular form; the two piers supporting it were reinforced and the original Umayyad mosaics of the northern inner façade were renewed. The northern riwaq ("portico") was rebuilt in 1089. The Seljuk atabeg of Damascus, Toghtekin (r. 1104–1128), repaired the northern wall in 1110 and two inscribed panels located above its doorways were dedicated to him. In 1113, the Seljuk atabeg of Mosul, Sharaf al-Din Mawdud (r. 1109–1113), was assassinated in the Umayyad Mosque. As the conflict between Damascus and the Crusaders intensified in the mid-12th century, the mosque was used as a principal rallying point calling on Muslims to defend the city and return Jerusalem to Muslim hands. Prominent imams, including Ibn 'Asakir, preached a spiritual struggle jihad (" in Arabic the word means struggle/Strive") and when the Crusaders advanced towards Damascus in 1148, the city's residents heeded their calls; the Crusader army withdrew as a result of their resistance. 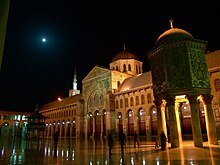 In Damascus there is a mosque that has no equal in the world, not one with such fine proportion, nor one so solidly constructed, nor one vaulted so securely, nor one more marvellously laid out, nor one so admirably decorated in gold mosaics and diverse designs, with enamelled tiles and polished marbles. During the reign of Nur ad-Din Zangi, which began in 1154, a second monumental clock, the Jayrun Water Clock, was built on his personal orders. It was constructed outside the eastern entrance to the mosque (Bab Jayrun) by architect Muhammad al-Sa'āti, was rebuilt by al-Sa'ati following a fire in 1167 and was eventually repaired by his son, Ridwan, in the early 13th century. It may have survived into the 14th century. The Arab geographer al-Idrisi visited the mosque in 1154. Damascus witnessed the establishment of several religious institutions under the Ayyubids, but the Umayyad Mosque retained his place as the center of religious life in the city. Muslim traveller Ibn Jubayr described the mosque as containing many different zawaya for religious and Quranic studies. In 1173, the northern wall of the mosque was damaged again by fire and was rebuilt by the Ayyubid sultan, Saladin (r. 1174–1193), along with the Minaret of the Bride, which had been destroyed in the 1069 fire. During the internal feuds between later Ayyubid princes, the city was dealt a great deal of damage, and the mosque's eastern minaret—known as the "Minaret of Jesus"—was destroyed at the hands of as-Salih Ayyub while besieging as-Salih Ismail in 1245. The minaret was later rebuilt with little decoration. Saladin, along with many of his successors, were buried around the Umayyad Mosque. The Mongols, under the leadership of Kitbuqa, in alliance with Crusader forces, captured Damascus from the Ayyubids in 1260. Bohemond VI of Antioch, a leading general in the invasion, ordered Catholic Mass to be performed in the Umayyad Mosque. However, the Mamluks, led by Qutuz and Baibars, wrested control of the city later in the same year. In 1270, Baibars, by now the Mamluk sultan, ordered extensive restorations to the mosque, particularly its marble, mosaics and gildings. According to Baibars' biographer, Ibn Shaddad, the restorations cost the sultan a sum of 20,000 dinars. Among the largest mosaic fragments restored was a 34.5 by 7.3 metres (113 by 24 ft) segment in the western portico called the "Barada panel". The mosaics that decorated the mosque were a specific target of the restoration project and they had a major influence on Mamluk architecture in Syria and Egypt. In 1285, the Muslim scholar Ibn Taymiyya started teaching Qur'an exegesis in the mosque. When the Il-Khan Mongols under Ghazan invaded the city in 1300, Ibn Taymiyya preached jihad, urging the citizens of Damascus to resist their occupation. The Mamluks under Qalawun drove out the Mongols later that year. When Qalawun's forces entered the city, the Mongols attempted to station several catapults in the Umayyad Mosque because the Mamluks had started fires around the citadel to prevent Mongol access to it. The attempt failed as the Mamluks proceeded to burn the catapults before they were placed in the mosque. The Mamluk Viceroy of Syria, Tankiz, carried out restoration work in the mosque in 1326-28. He reassembled the mosaics on the qibla wall and replaced all the marble tiles in the prayer hall. Mamluk sultan al-Nasir Muhammad also undertook major restoration work for the mosque in 1328. He demolished and completely rebuilt the unstable qibla wall and moved the Bab al-Ziyadah gate to the east. Much of that work was damaged during a fire that burned the mosque in 1339. Islamic art expert, Finbarr B. Flood, describes the Bahri Mamluks' attitude towards the mosque as an "obsessive interest" and their efforts at maintaining, repairing and restoring the mosque were unparalleled in any other period of Muslim rule. Arab astronomer Ibn al-Shatir worked as the chief muwaqqit ("religious timekeeper") and the chief muezzin at the Umayyad Mosque from 1332 until his death in 1376. He erected a large sundial on the mosque's northern minaret in 1371. The Minaret of Jesus was burnt down in a fire in 1392. Timur sacked Damascus in 1400. He ordered the burning of the city on March 17, and the fire ravaged the Umayyad Mosque. The eastern minaret was reduced to rubble, and the central dome collapsed. A southwestern minaret was added to the mosque in 1488 during the reign of Mamluk sultan Qaitbay. The Ottomans under Selim I conquered Damascus from the Mamluks in 1516. The first Friday prayer performed in Selim's name in the Umayyad Mosque was attended by the sultan himself. The Ottomans used an endowment system (waqf) for religious sites as a means to link the local population with the central authority. The waqf of the Umayyad Mosque was the largest in the city, employing 596 people. Supervisory and clerical positions were reserved for Ottoman officials while religious offices were held mostly by members of the local 'ulema. Although the awqaf (plural form of "waqf") were taxed, the waqf of the Umayyad Mosque was not. In 1518, the Ottoman governor of Damascus and supervisor of the mosque's waqf, Janbirdi al-Ghazali, had the mosque repaired and redecorated as part of his architectural reconstruction program for the city. Prominent Sufi scholar Abd al-Ghani al-Nabulsi taught regularly at the Umayyad Mosque starting in 1661. The mosque's extensive mosaics and its marble panelling were once again ravaged by fire in 1893, and had to be restored. The fire also destroyed the inner fabric of the prayer hall and caused the collapse of the mosque's central dome. A laborer engaging in repair work accidentally started the fire when he was smoking his nargila (water pipe). The Ottomans fully restored the mosque, but largely maintained the original structure. Until 1899 the mosque's library included the "very old" Qubbat al-Khazna collection; "most of its holdings were given to the German emperor William II and only a few pieces kept for the National Archives in Damascus." It is the burial place of first three martyrs of the Ottoman Aviation Squadrons, who were Navy Lieutenant (Ottoman Turkish: Bahriye Yüzbaşısı) Fethi Bey and his navigator, Artillery First Lieutenant (Ottoman Turkish: Topçu Mülazım-ı Ula) Sadık Bey and The second team's member Artillery Second Lieutenant (Ottoman Turkish: Topçu Mülazım-ı Saniye) Nuri Bey. These officers were on a mission of the Istanbul-Cairo expedition of 1914. The Umayyad Mosque underwent major restorations in 1929 during the French Mandate over Syria and in 1954 and 1963 under the Syrian Republic. In the 1980s and in the early 1990s, Syrian president Hafez al-Assad ordered a wide-scale renovation of the mosque. The methods and concepts of al-Assad's restoration project were heavily criticized by UNESCO,[clarification needed] but the general approach in Syria was that the mosque was more of a symbolic monument rather than a historical one and thus, its renovation could only enhance the mosque's symbolism. On March 15, 2011, the first significant protests related to the Syrian civil war began at the Umayyad Mosque when 40–50 worshipers gathered outside the complex and chanted pro-democracy slogans. Syrian security forces swiftly quelled the protests and have since cordoned off the area during Friday prayers to prevent large-scale demonstrations. The ground plan of the Umayyad Mosque is rectangle in shape and measures 97 meters (318 ft) by 156 meters (512 ft). A large courtyard occupies the northern part of the mosque complex, while the haram ("sanctuary") covers the southern part. The courtyard is enclosed by four exterior walls. The level of the stone pavement had become uneven over time due to several repairs throughout the mosque's history, but recent work on the courtyard has restored it to its consistent Umayyad-era levels. Arcades (riwaq) surround the courtyard supported by alternating stone columns and piers. There is one pier in between every two columns. Because the northern part of the courtyard had been destroyed in an earthquake in 1759, the arcade is not consistent; when the northern wall was rebuilt the columns that were supporting it were not. Three arcades make up the interior space of the sanctuary. They are parallel to the direction of prayer which is towards Mecca in modern-day Saudi Arabia. The arcades are supported by two rows of stone Corinthian columns. Each of the arcades contain two levels. The first level consists of large semi-circular arches, while the second level is made up of double arches. This pattern is the same repeated by the arcades of the courtyard. The three interior arcades intersect in the center of the sanctuary with a larger, higher arcade that is perpendicular to the qibla ("direction of prayer") wall and faces the mihrab (niche in the wall which indicates the qibla) and the minbar ("pulpit"). The central transept divides the arcades into two halves each with eleven arches. The entire sanctuary measures 136 meters (446 ft) by 37 meters (121 ft) and takes up the southern half of the mosque complex. Four mihrabs line the sanctuary's rear wall, the main one being the Great Mihrab which is located roughly at the center of the wall. The Mihrab of the Companions of the Prophet (named after the Sahaba) is situated in the eastern half. According to ancient Muslim engineer Musa ibn Shakir, the latter mihrab was built during the mosque's initial construction and it became the third niche-formed mihrab in Islam's history. 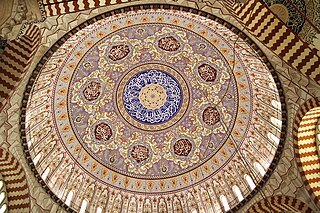 The largest dome of the mosque is known as the "Dome of the Eagle" (Qubbat an-Nisr) and located atop the center of the prayer hall. The original wooden dome was replaced by one built of stone following the 1893 fire. It receives its name because it is thought to resemble an eagle, with the dome itself being the eagle's head while the eastern and western flanks of the prayer hall represent the wings. With a height of 36 meters (118 ft), the dome rests on an octagonal substructure with two arched windows on each of its sides. It is supported by the central interior arcade and has openings along its parameter. Within the Umayyad Mosque complex are three minarets. The Minaret of the Bride (Madhanat al-Arus) was the first one built and is located on the mosque's northern wall. The exact year of the minaret's original construction is unknown. The bottom part of the minaret most likely dates back to the Abbasid era in the 9th century. While it is possible that the Umayyads built it, there is no indication that a minaret on the northern wall was a part of Caliph al-Walid's initial concept. Geographer al-Muqaddasi visited the minaret in 985 when Damascus was under Abbasid control and described it as "recently built." The upper segment was constructed in 1174. This minaret is used by the muezzin for the call to prayer (adhan) and there is a spiral staircase of 160 stone steps that lead to the muezzin's calling position. The Minaret of the Bride is divided into two sections; the main tower and the spire which are separated by a lead roof. The oldest part of the minaret, or the main tower, is square in shape, has four galleries, and consists of two different forms of masonry; the base consists of large blocks, while the upper section is built of dressed stone. There are two light openings near the top of the main tower, before the roof, with horseshoe arches and cubical capitals enclosed in a single arch. A smaller arched corbel is located below these openings. According to local legend, the minaret is named after the daughter of the merchant who provided the lead for the minaret's roof who was married to Syria's ruler at the time. Attached to the Minaret of the Bride is the 18th-century replica of the 14th-century sundial built by Ibn al-Shatir. The Minaret of Jesus (Madhanat Isa), located on the southeast corner of the mosque complex, is around 77 meters (253 ft) in height and the tallest of the three minarets. Some sources claim it was originally built by the Abbasids in the 9th century, while other sources attribute the original structure to the Umayyads. The main body of the current minaret was built by the Ayyubids in 1247, but the upper section was constructed by the Ottomans. The main body of the minaret is square-shaped and the spire is octagonal. It tapers to a point and is surmounted by a crescent (as are the other two minarets.) Two covered galleries are situated in the main body and two open galleries are located on the spire. Islamic belief holds that Jesus will descend from heaven before the Day of Judgement to confront the Antichrist. According to local Damascene tradition, he will reach earth via the Minaret of Jesus, hence its name. Ibn Kathir, a prominent 14th-century Muslim scholar, backed this notion. The Western Minaret (Madhanat al-Gharbiyya) is also known as the "Minaret of Qaitbay" as it was built by Mamluk sultan Qaitbay in 1488. The Western Minaret displays strong Islamic-era Egyptian architectural influence typical of the Mamluk period. The minaret is octagonal in shape and is built in receding sections with three galleries. It is generally believed that both the Minaret of Jesus and the Western Minaret were built on the foundation of Ancient Roman towers (temenos), but some scholars[who?] find this to be questionable because of the absence of corner towers in other former Roman temples. The Umayyad Mosque is one of the few early mosques in the world to have maintained the same general structure and architectural features since its initial construction in the early 8th century and its Umayyad character has not been significantly altered. Since its establishment, the mosque has served as a model for congregational mosque architecture in Syria as well as globally. According to art historian, Finnbar Barry Flood, "the construction of the Damascus mosque not only irrevocably altered the urban landscape of the city, inscribing upon it a permanent affirmation of Muslim hegemony, but by giving the Syrian congregational mosque its definitive form it also transformed the subsequent history of the mosque in general." Examples of the Umayyad Mosque's ground plan being used as a prototype for other mosques in the region include the al-Azhar Mosque and Baybars Mosque in Cairo, the Great Mosque of Cordoba in Spain, and the Bursa Grand Mosque and Selimiye Mosque in Turkey. Shrine housing the head of Prophet Yahya (John the Baptist). The location where Husayn's head was displayed, buried in Imam Hussein Mosque. The Umayyad Mosque holds great significance to Shia and Sunni Muslims, as this was the destination of the ladies and children of the family of Muhammad, made to walk here from Iraq, following the Battle of Karbala. Furthermore, it was the place where they were imprisoned for 60 days. ^ a b Flood, 2001, p.2. ^ Takeo Kamiya (2004). "Umayyad Mosque in Damascus, Syria". Eurasia News. Retrieved 31 December 2015. ^ a b c Flood, 2001, pp.124–126. Some information used in the article is provided by the footnotes of this source. ^ a b c d e f g h Burns, 2005, pp.131–132. ^ a b Burns, 2005, pp.141–142. ^ a b Walker, 2004, p.36-37. ^ a b Flood, 1997, p.67. ^ Christian C. Sahner (17 July 2010). "A Glittering Crossroads". The Wall Street Journal. Retrieved 27 February 2011. ^ "Inside the Umayyad mosque". BBC News. 2001-05-06. Retrieved 2010-05-26. ^ Protesters stage rare demo in Syria. Al-Jazeera English. 2011-03-15. Al-Jazeera. ^ Syria unrest: New protests erupt across country. BBC News. 2011-04-01. ^ a b c Umayyad Mosque Profile Archived 2010-11-20 at the Wayback Machine. Archnet Digitial Library. ^ a b Grafman and Ayalon, 1999, p.8. ^ a b c d Darke, p.92. ^ a b c d American architect and architecture, 1894, p.58. ^ Palestine Exploration Fund, p.292. ^ a b c d e Mannheim, 2001, p.91. ^ Qummi, Shaykh Abbas (2005). Nafasul Mahmoom. Qum: Ansariyan Publications. p. 362. ^ Nafasul Mahmoom. p. 368. ^ a b Nafasul Mahmoom. p. 367. ^ Tafseer Durre Manthur Vol.6, p. 30-31. ^ Tafseer Ibn Katheer, vol.9, p.163, published in Egypt. Tafseer Durre Manthur Vol.6, p.30-31. ^ Nafasul Mahmoom. p. 381. American architect and architecture, J. R. Osgood & Co, 1894 . Dumper, Michael; Stanley, Bruce E. (2007). Cities of the Middle East and North Africa: A Historical Encyclopedia. ABC-CLIO. ISBN 1-57607-919-8. Finkel, Caroline (2005), Osman's dream: the story of the Ottoman Empire, 1300-1923, Basic Books, ISBN 0-465-02396-7 . Flood, Finbarr Barry (1997). "Umayyad Survivals and Mamluk Revivals: Qalawunid Architecture and the Great Mosque of Damascus". Muqarnas. Boston: BRILL. 14: 57–79. doi:10.2307/1523236. Ibn Ṣaṣrā, Muḥammad ibn Muḥammad (1963). William M. Brinner (ed.). A chronicle of Damascus, 1389-1397. University of California Press. Kafescioǧlu, Çiǧdem (1999). ""In The Image of Rūm": Ottoman Architectural Patronage in Sixteenth-Century Aleppo and Damascus". Muqarnas. BRILL. 16: 70–96. doi:10.2307/1523266. Kamal al-Din, Nuha; Ibn Kathir (2002). The Islamic view of Jesus. Islamic Books. ISBN 977-6005-08-X. Palestine Exploration Fund (1897), Quarterly statement, Published at the Fund's Office . Rivoira, Giovanni Teresio (1918), Moslem architecture: its origins and development, Oxford University Press . Selin, Helaine, ed. (1997), Encyclopaedia of the history of science, technology, and medicine in non-western cultures, Springer, ISBN 978-0-7923-4066-9 . Walker, Bethany J. (Mar 2004). "Commemorating the Sacred Spaces of the Past: The Mamluks and the Umayyad Mosque at Damascus". Near Eastern Archaeology. The American Schools of Oriental Research. 67 (1): 26–39. doi:10.2307/4149989. Winter, Michael; Levanoni, Amalia (2004). The Mamluks in Egyptian and Syrian politics and society. BRILL. ISBN 90-04-13286-4. Wikimedia Commons has media related to Umayyad Mosque. Mihrab is a semicircular niche in the wall of a mosque that indicates the qibla; that is, the direction of the Kaaba in Mecca and hence the direction that Muslims should face when praying. The wall in which a mihrab appears is thus the "qibla wall". Al-Masjid an-Nabawī is a mosque established and originally built by the Islamic Prophet Muhammad, situated in the city of Medina in the Hejaz region of Saudi Arabia. It was the third mosque built in the history of Islam, and is now one of the largest mosques in the world. It is the second-holiest site in Islam, after the Great Mosque in Mecca. It is always open, regardless of date or time. The Great Mosque of Kairouan, also known as the Mosque of Uqba, is a mosque situated in the UNESCO World Heritage town of Kairouan, Tunisia. The Aqsunqur Mosque is located in Cairo, Egypt and is one of several "blue mosques" in the world. It is situated in the Tabbana Quarter in Islamic Cairo, between Bab Zuweila and the Citadel of Saladin The Aqsunqur Mosque also serves as a funerary complex, containing the mausoleums of its founder Shams ad-Din Aqsunqur, his sons, a number of children of the Bahri Mamluk sultan an-Nasir Muhammad and that of its principal restorer, Ibrahim Agha al-Mustahfizan. Dome of the Chain is a free-standing dome located adjacently east of the Dome of the Rock in the Old City of Jerusalem. The White Mosque is an ancient Ummayad mosque in the city of Ramla, Israel. Only the minaret is still standing. According to local Islamic tradition, the northwest section of the mosque contained the shrine of a famous Islamic saint, Nabi Salih. The Mansouri Great Mosque is a mosque in Tripoli, Lebanon, also known simply as The Great Mosque of Tripoli. It was built in the Mamluk period, from 1294 to 1314, around the remains of a Crusader Church of St. Mary. In any case, the two Christian elements in no way detract from the traditional Muslim nature of this great royal mosque, the first building erected in Mamluk Tripoli. The Khalid ibn al-Walid Mosque is a mosque in Homs, Syria, located in a park along Hama Street in ash-Shuhada Square. Noted for its Ottoman-Turkish architectural style, the mosque is dedicated to Khalid ibn al-Walid, an Arab military commander who led the Muslim conquest of Syria in the 7th century following the decisive Battle of Yarmouk, which put an end to Byzantine rule in Syria. His dome-topped mausoleum is located in a corner of the prayer hall and has served as a pilgrimage center. Two tall minarets with narrow galleries constructed of alternating horizontal rows of white and black stone are situated at the building's northwestern and northeastern comers and reflect the traditional Islamic architecture style of the Levant. Al-Azhar Mosque, also simply in Egypt Al-Azhar, is an Egyptian mosque in Islamic Cairo. Al-Mu'izz li-Din Allah of the Fatimid dynasty commissioned its construction for the newly established capital city in 970. Its name is usually thought to allude to the Islamic prophet Muhammad's daughter Fatimah, a revered figure in Islam who was given the title az-Zahrā′. It was the first mosque established in Cairo, a city that has since gained the nickname "the City of a Thousand Minarets." Qubbat al-Khazna, meaning the "Dome of the Treasury", is an old structure, located inside the courtyard of the Umayyad Mosque in Damascus, Syria. It is an octagonal structure decorated with mosaics, standing on eight Roman columns. The Dome of the Treasury, like the mosque's prayer hall facade, was once completely covered in the colorful mosaic decoration for which the mosque was famous. The dome was built under orders from the governor of Damascus, Fadl ibn Salih, in 789. Al-Fadl ibn Salih ibn Ali ibn Abdillah ibn Abbas (740–789) was the Abbasid governor of a number of different provinces in Syria during the late 8th-century CE. He was also governor of Egypt for a brief period of time. He was related to the Abbasid caliphs and was part of the Banu Salih branch of the Abbasid dynasty. The Mahkamah Mosque is a congregational mosque and madrasa, built in 1455. It was destroyed by Israeli bombing during the attack on Gaza in 2014. The mosque was located along Baghdad Street near the main western entrance of the Shuja'iyya district in Gaza City, Palestine. The Fatimid architecture that developed in the Fatimid Caliphate (909–1167 CE) of North Africa combined elements of eastern and western architecture, drawing on Abbasid architecture, Byzantine, Ancient Egyptian, Coptic architecture and North African traditions; it bridged early Islamic styles and the medieval architecture of the Mamluks of Egypt, introducing many innovations. Umayyad architecture developed in the Umayyad Caliphate between 661 and 750, primarily in its heartlands of Syria and Palestine. It drew extensively on the architecture of other Middle Eastern civilizations and that of the Byzantine Empire, but introduced innovations in decoration and new types of building such as mosques with mihrab's and minarets. The Great Mosque of Sousse is a historical mosque in the coastal city of Sousse, Tunisia. The construction dates back to 851 during the rule of Aghlabid Dynasty, a vassal of the Abbasid Caliphate, and it was commissioned by amir Abu al-‘Abbas Muhammad al-Aghlabi. The mosque was renovated and improved several times during the 10th and 17th centuries. It is adjacent to the ribat, which influenced the mosque's fortified appearance with a wall with balconies and barges overlooking the beach where it could attack raiders from behind. It is a part of UNESCO World Heritage Site Medina of Sousse.